Veteran Canadian actor and octogenarian senior citizen Christopher Plummer was born Arthur Christopher Orme Plummer on December 13, 1929 in Toronto, Ontario. During an acting career that has spanned 8 decades, Plummer has acquired 2 Tony Awards, 2 Emmy Awards, and an Academy Award, along the way amassing 200+ film credits and hundreds of stage roles. Below, Christopher Plummer gave an interview to The National's Peter Mainsbridge in 2015 and reflected on his career and recognition. Christopher Plummer's childhood was one of wealth, growing up as the great grandson of former Canada's 3rd Prime Minister, Sir John Abbott. Like fellow Canadian actor and occasional costar William Shatner, he grew up in Quebec, and attended McGill University. He speaks both French and English fluently. Plummer began his professional career on stage with the Montreal Repertory Theatre (where he and Shatner first met). His internship at the Canadian Repertory Company in Ottawa, Ontario (1948-1950) coincided with William Shatner's time there as well. It was Shatner that understudied Christoper Plummer at the Shakespearean Stratford Festival in Stratford, Ontario in a production of Henry V during the mid-1950s. an episode of Omnibus "Oedipus, the King" in 1957.
the Canadian TV movie Riel (1979); co-starring with fellow Canadian Donald Sutherland. and were on opposing sides in the feature film Star Trek VI: The Undiscovered Country (1991). Shatner and Plummer's co-stars in Star Trek VI: The Undiscovered Country included original Star Trek cast members Leonard Nimoy, DeForest Kelley, James Doohan, and George Takei; as well as Kim Cattrall, Kurtwood Smith, John Schuck, and Christian Slater. Plummer is virtually unrecognizable as a Klingon (below) in Star Trek VI: The Undiscovered Country. Throughout his career, Christopher Plummer has returned to perform at Ontario's Shakespearean Stratford Festival and has said many times that the stage and Shakespeare are his greatest theatrical loves. During the 1950's, Christopher Plummer alternated between stage roles in Canada, the United Kingdom, and on-and-off Broadway in New York. He made his television debut in "Othello", a 1953 episode of the Canadian television series Encounter, that starred Lorne Greene. Over 20 years later, Lorne Greene and Christopher Plummer would be among the all-star cast of the television mini-series Arthur Hailey's the Moneychangers (1976), along with Kirk Douglas, Timothy Bottoms, Susan Flannery, Joan Collins, Helen Hayes (The Snoop Sisters), Ralph Bellamy (The Waltons), and Hayden Rorke. During the 1950s Christopher Plummer hit his stride as a powerful, magnetic actor on stage; and an excessive drinker, partier and sexual adventurer off-stage. By this time, Plummer had also met young singer and actress Tammy Grimes, when she came backstage to congratulate him on his performance on Broadway in early 1955 in The Dark Is Light Enough. He was good friends with fellow actor and heavy drinker Jason Robards; the two recalled for The New York Times how they first met during the 1950's era of live television. Both Jason Robards and Christopher Plummer appeared on an episode of Appointment with Adventure in 1956 and on an a fast, life-long friendship was born. 38 years later, friends Jason Robards and Christopher Plummer were appearing on stage together in No Man's Land on Broadway in 1994, and living within 10 miles of each other in Connecticut with their respective spouses. By then both actors had long given up their hard-drinking ways; Robards after a 1972 life-changing automobile crash, and Plummer around the same time, thanks to feedback from his wife. Robards said "We didn't do anything in the 60's other than run into each other. In bars...We'd be out with Albie Finney and Jack Cassidy. O'Toole, Burton. It was the social life!" In 1956, Christopher Plummer and friend Jason Robards were guest-stars on an episode of The Alcoa Hour, along with Lee Grant and Boris Karloff. Plummer has said of Boris Karloff that he was a "truly good human." Boris Karloff and Christopher Plummer had appeared together onstage in the Lillian Hellman play The Lark the previous year (1955), along with Julie Harris. 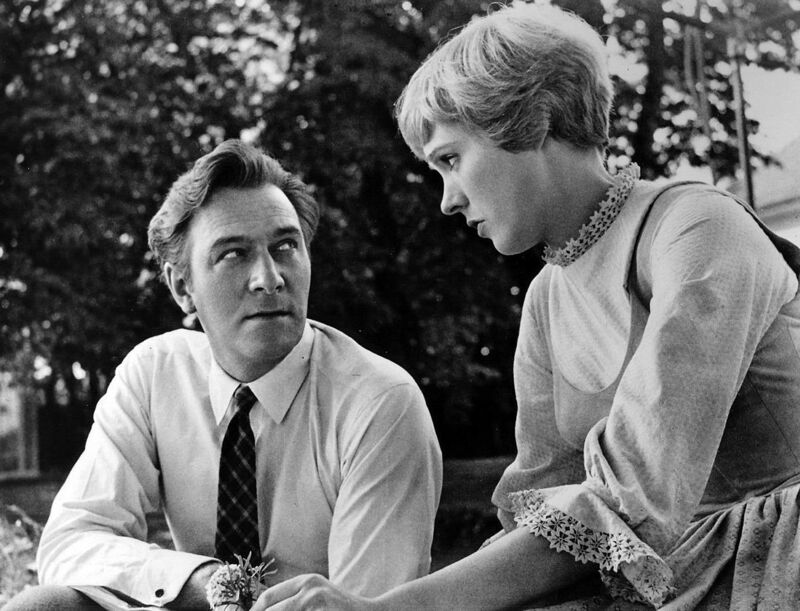 Christopher Plummer would work together onstage 5 more times with Julie Harris (her most frequent co-star), and they co-starred in several movies, including the TV movie Johnny Belinda (1958) with Rip Torn; and A Doll's House (1959), a TV drama co-starring Jason Robards and Richard Thomas. Julie Harris and Christopher Plummer co-starred with George Peppard (Banacek) in Little Moon of Alban (1958). Little Moon of Alban was Christopher Plummer's first TV movie, and he was nominated for a Primetime Emmy Award as Outstanding Lead Actor in a Miniseries or Movie, for his performance. In August 1956, Christopher Plummer married Tammy Grimes. Before Tammy and Christopher Plummer drifted apart and divorced in 1960, they had daughter Amanda Plummer in March 1957. Plummer said he lost track of time while drinking with friends in a bar while his wife was in labour, and missed his daughter Amanda's birth. Plummer acknowledged in his memoir that "I was a lousy husband and an even worse father." Tammy moved out of their home, taking Amanda with her; Christopher Plummer rarely saw his daughter Amanda Plummer until she was an adult and had become an actress herself. Tammy Grimes would remarry a couple of times; she died in October 2016 at the age of 82. Christopher Plummer's first feature film was the romantic drama Stage Struck (1958) with Henry Fonda and Susan Strasberg. That same year, he co-starred in Wind Across the Everglades (1958) in a cast that included Burl Ives, Gypsy Rose Lee, and Peter Falk. Robert Redford was in the TV movie Captain Brassbound’s Conversion (1960), starring Greer Garson and Christopher Plummer. Plummer was the title character, while Redford was simply “Blue Jacket” in Captain Brassbound’s Conversion. The feature film Inside Daisy Clover (1965) co-starred Christopher Plummer, Natalie Wood, Robert Redford, and Roddy McDowall. Below, the movie trailer for Inside Daisy Clover features Natalie Wood, Ruth Gordon, Christopher Plummer, and Robert Redford. Inside Daisy Clover not only reunited Robert Redford and Plummer onscreen, it was the first time that friends Roddy McDowall and Christopher Plummer were in a movie together. In his 2008 memoir In Spite of Myself by Christopher Plummer, he recounts first working with actor Roddy McDowall when they co-starred on Broadway in The Tempest in 1955 with Raymond Massey and Jack Palance; a friendship grew outside the theatre. Between 1961-1962, Christopher Plummer hosted 5 episodes of the TV series Playdate. In December 1962, the TV movie Cyrano De Bergerac (1962) was released. Christopher Plummer starred in Cyrano De Bergerac opposite Hope Lange (The Ghost and Mrs. Muir); also in the cast of Cyrano De Bergerac were fellow Canadian actors Don Harron and Gordon Pinsent. More than 20 years later, in the TV musical comedy movie Parade of Stars (1983), Plummer resurrected the character of Cyrano De Bergerac. Plummer told People magazine that when he moved to England in the early 1960's he was interviewed by a beautiful British Fleet Street journalist called Patricia Lewis . A romance began, and Lewis suffered disfiguring injuries after crashing her convertible into a pillar near Buckingham Palace while driving home late night with Plummer (he wasn't seriously hurt). Christopher Plummer and Patricia Lewis married in May 1962. Plummer was already a heavy drinker and partier, and after her accident Patricia Lewis also began to drink heavily. Their relationship disintegrated and Patricia and Christopher Plummer divorced in 1967 after 5 years of marriage. The Sound of Music (1965) co-starred Christopher Plummer and Julie Andrews, and is the movie that Plummer is most often associated with by his baby boomer and senior fans. Plummer has said he was mis-cast in the sentimental musical The Sound of Music, as he was a non-singing, non-dancing serious stage actor. Plummer was ensconced at an Austrian hotel while The Sound of Music was being shot; he was frequently drunk, had an affair, and at one point gained too much weight to fit into his costume. Below, Christopher Plummer sings Edelweiss to fellow actors Eleanor Parker, Max Detweiler, Julie Andrews, and his onscreen children, in this Rodgers and Hammerstein's videoclip from The Sound of Music. In the years after The Sound of Music, Christopher Plummer would frequently refer to it as "The Sound of Mucus,” while acknowledging that the movie worked on many levels (especially financially). 36 years after The Sound of Music, now both in their senior citizen years, Christopher Plummer and Julie Andrews were reunited onscreen in the TV movie On Golden Pond (2001) with Glenne Headly and Sam Robards (the son of Plummer's good friend Jason Robards and Lauren Bacall). 2 movies with Omar Sharif - The Fall of the Roman Empire (1964), with co-stars Sophia Loren, Stephen Boyd, Alec Guinness, and James Mason; and The Night of the Generals (1967) starring Peter O'Toole. Below, Christopher Plummer and Sophia Loren are among the featured cast members in the Paramount Pictures movie trailer for The Fall of the Roman Empire, below. Hamlet at Elsinore (1964), a TV movie with Donald Sutherland in the cast. Christopher Plummer was nominated again for a Primetime Emmy Award for Outstanding Lead Actor in a Miniseries or Movie, for his performance in Hamlet at Elsinore. Battle of Britain (1969) starred Michael Caine, with Trevor Howard, Curd Jürgens (Kurt Jurgens), Ian McShane, Laurence Olivier, and Susannah York. Christopher Plummer and Laurence Olivier had also acted on stage together when Plummer was in England. The Royal Hunt of the Sun (1969). Conduct Unbecoming (1975), with Richard Attenborough, Stacy Keach, Susannah York. Aces High (1976), with Malcolm McDowell, Peter Firth, John Gielgud, and Ray Milland. Nobody Runs Forever (1968) also known as The High Commissioner, co-starring Rod Taylor. The Disappearance (1977), a British-Canadian thriller with John Hurt, and Sutherland's live-in love Francine Racette. James Mason and Christopher Plummer were also part of the all-star cast in the TV mini-series Jesus of Nazareth (1977). Their co-stars in Jesus of Nazareth included Ian McShane, Olivia Hussey, Michael York, Claudia Cardinale, Laurence Oliver, Rod Steiger, and Stacy Keach. Ordeal by Innocence (1984), an Agatha Christie novel adapation with Faye Dunaway. Sarah Miles, and Ian McShane. In an interview with The Globe and Mail in 2012, Christopher Plummer reflected back on his era of heavy drinking and carousing in the 1950s and 1960's. He said he drank because he enjoyed it, it hid his lack of confidence and shyness, and it was "the fashion" of the time, especially in the world of the theatre and with hard-drinking buddies like Jason Robards, Peter O'Toole, Richard Burton, Rex Harrison and Albert Finney. Fuelled by booze (but never drugs), Plummer also indulged in affairs and reckless sexual encounters at parties.